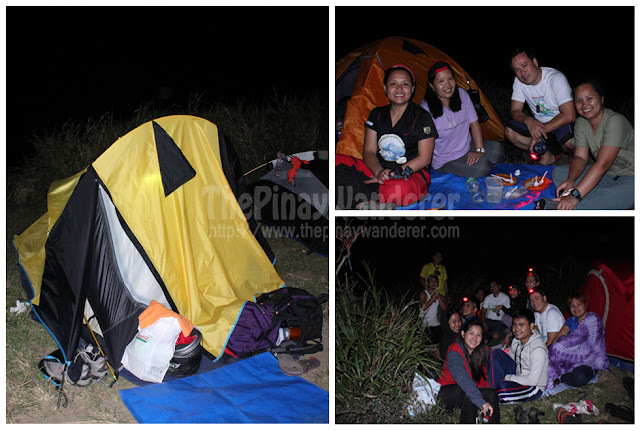 Just like a few weeks ago, I joined with some friends who went for an overnight camping in Mts. 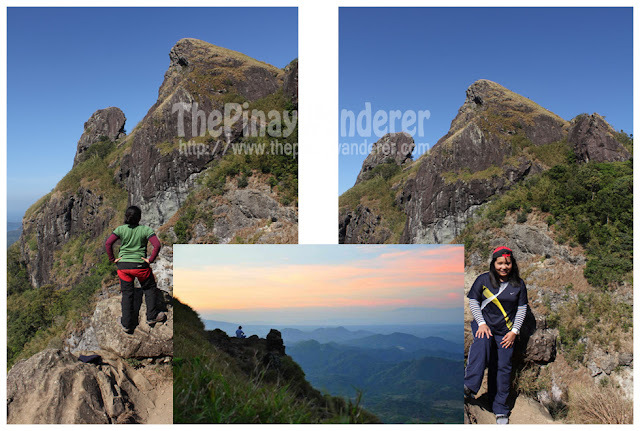 Palay-Palay/Mataas na Gulod or more popularly known as Mt. 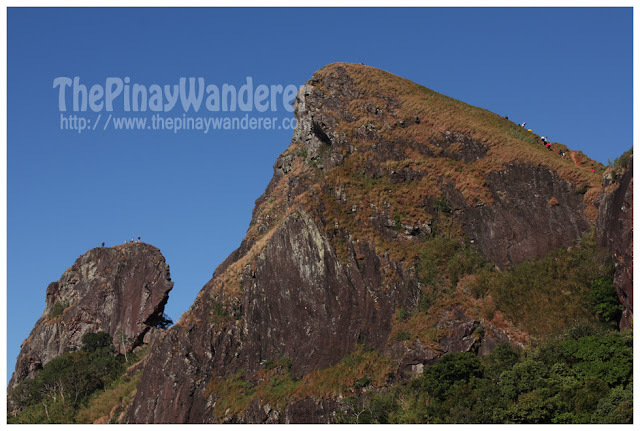 Pico de Loro in Maragondon, Cavite. I joined in this adventure just for fun. Though this is my second time to join hiking adventure (my first time was in Mt. Manalmon in Bulacan), I never intend to become a serious mountaineer. I don’t have the determination and discipline that mountaineering requires. I don’t even go for a run or jogging or any physical activity which is supposed to be part of the training exercises that mountaineers undertake. 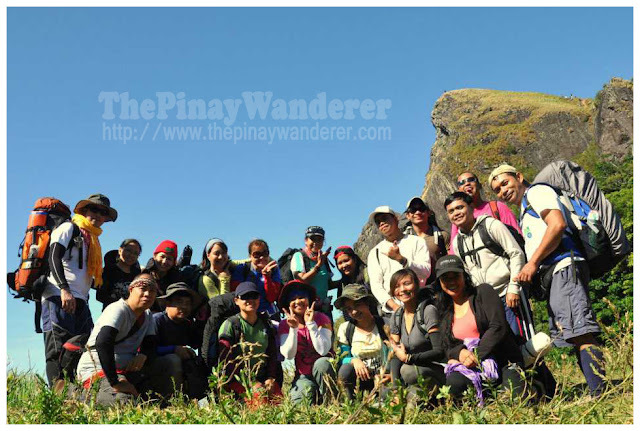 Anyway, last April 14-15, together with some mountaineer friends, we went to Mt. Pico de Loro. Call time was 6:00AM in McDonalds along Roxas Boulevard, near Baclaran Church. From there, we took an air-conditioned bus going to Naic, Cavite. 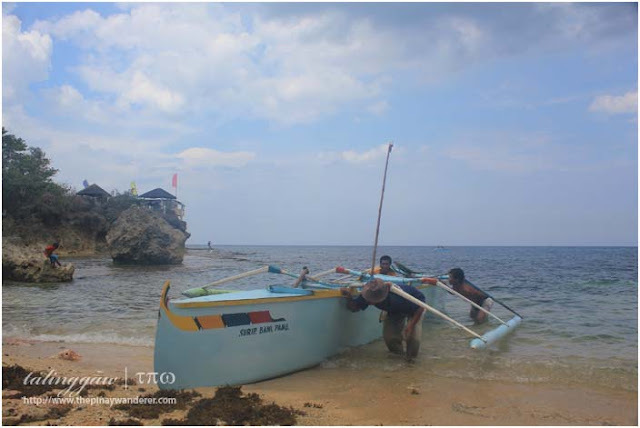 It took us more than two hours to reach Naic, where we are going to take a jeepney to the DENR (Department of Environment and Natural Resources) site in Maragondon. At the DENR office, we registered ourselves and paid PhP20 each as a registration fee. 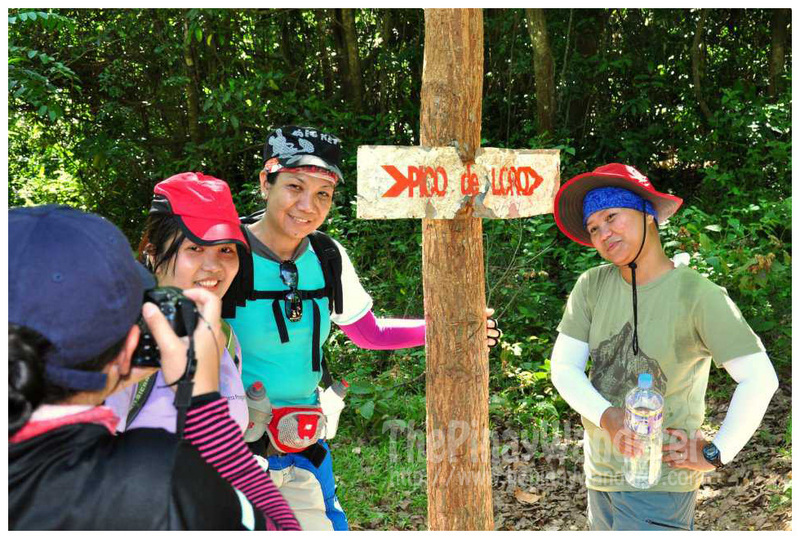 After registration and before we started our trekking, we said a short prayer for a safe ascent to and descent from Mt. Pico de Loro. We also did some stretching before heading to the base camp. The trail to the camp site is a bit easy at the start, most are downhill trek, some are just plain fields. 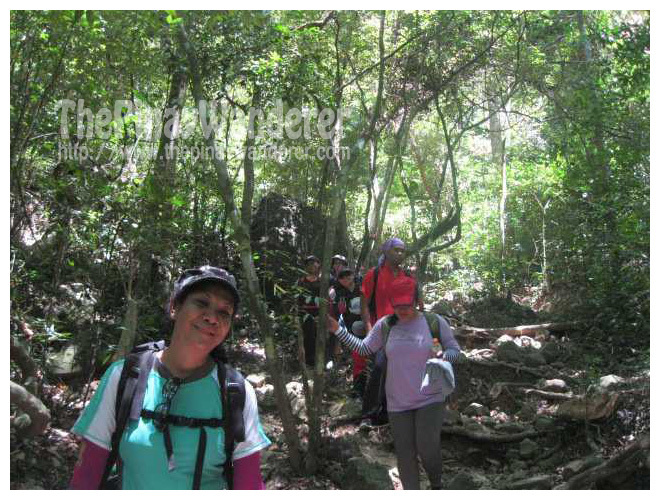 And the trail is mostly covered with trees, we spend more than 30 minutes of walking before we took rest again. And then we reached this signage which marked the start of an all-uphill trek. Haist, we were all tired but we still manage to smile at the camera...hehe! 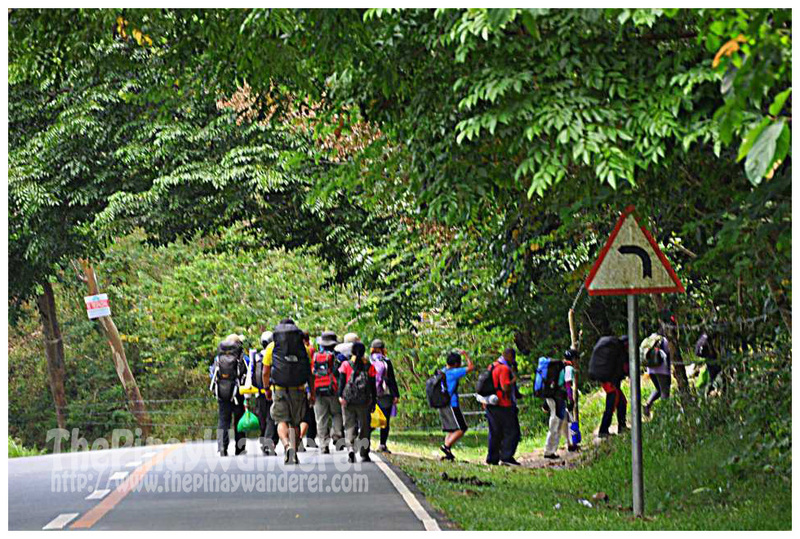 After some rest and picture taking, we continue our way and head off to the camp site. Since this is an all-uphill trek, it took us more than an hour before we reached the camp site, resting after every few minutes of trekking. Too exhausted, I wasn't able to help my partner assemble our tent, good thing she's an experienced mountaineer, thanks GB (her blogsite here). After fixing the tent, the group who is in-charge of preparing our dinner started their task. We on the other hand, prepare ourselves for the summit assault. We're in a rush because we're all looking for a chance to take photos of the sunset. The trail to the summit is very steep, I started getting nervous just after a few minutes of our ascent, but I still tried. My friend GB took my camera so I could have my hands free to hold onto something as a support. I made a few more steps but I really got nervous, I can't bring myself to make another step. Then we came across several mountaineers descending from the summit, they advised us to be very careful as the trail is very dangerous. That's when I decided not to continue; instead I go with them back to the camp site. Thank you my friends Say, Mobius and Ed for some of the photos used here. Note: Bring lots (and I mean lots) of water, nearest water source is at the base camp which more or less is 3 hours from the camp site. what a cool experience! im not really adventurous but i added Mt. apo to my 2012 goals. whoaa! I defo need a lot of jogging and hikings to do prior to the climb. Camping out is always always fun! love the photos! Wow yan ang dream ko talaga, ang makapag hiking! Inggit much akers. Hi Sherene, thanks for always visiting here. I'll let you know when I'm going to visit Ilocos Norte. Aha, ito pala yon... kaya pala inggit ka sa ice cream ko dahil liblib na lugar pala ang inakyat nyo... hehe But I won't trade an experience like this for an ice cream... the best ang ganitong trip! 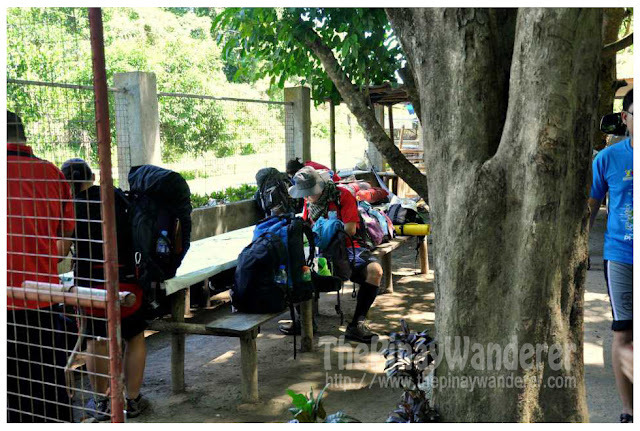 Sarap magganyan kasama friends plus camping pa, hay kakamiss ang highschool kung saan madalas kaming umakyat ng bundok at magbonding. Ang dami nyo hehe, way to go trekker Glen hehe! 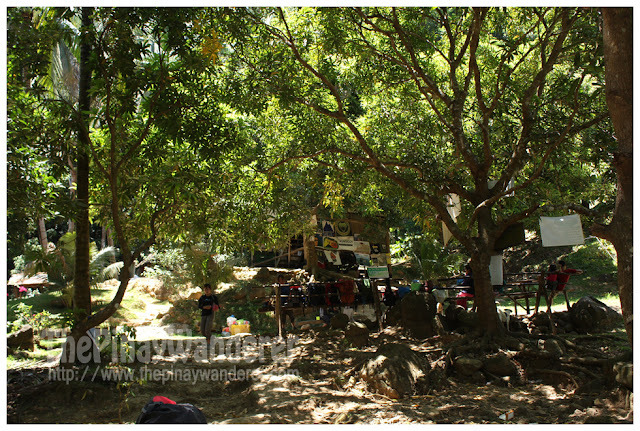 never been in Cavite's mountains..
Wow, ang saya-saya lalo na pag mga friends mo kasama mo sa camping...like it. Thanks for sharing your experience nakaka miss ang mga friends sa high school.Have fun and enjoy Ms. trekker...hehhehe..
wow, my takot ka pala sa heights,di yata halata sa mga travel and escapades mo. Galing mo at least kahit paano pumupunta ka sa mga bundok. 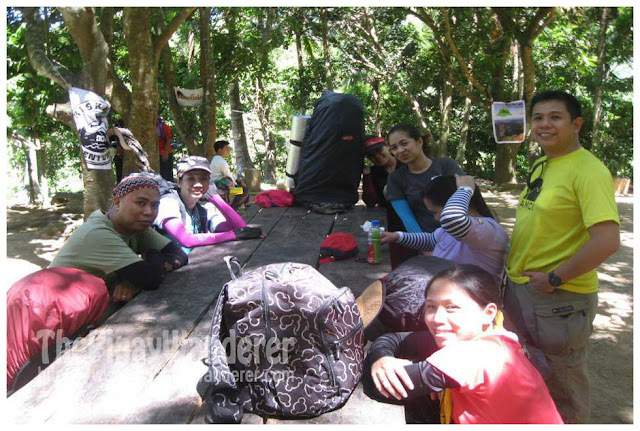 Don't worry dyan ka na rin papunta Ms. Trekker.hehehe. I like your escapades and style of traveling. Hi Joanne! Nasa harap ng cam eh, kelangan smile pa rin kahit hirap at takot, haha. 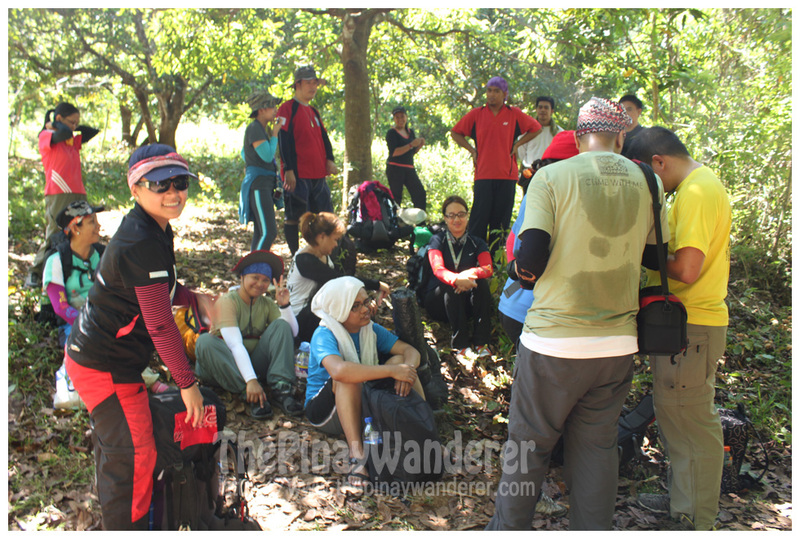 Kaya mo rin ang trekking lalo na at your age, mas madali pa ang mga bagay-bagay, at mas malakas ang loob. Matanda na kase ang lola mo kaya matatakutin na, hehe. 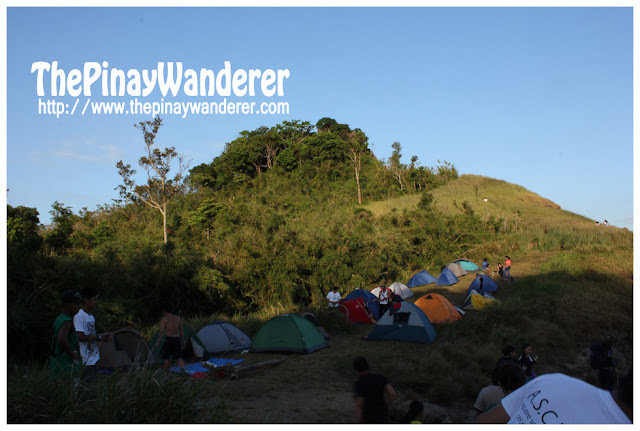 Ang saya naman ng camping na yan! Natuwa namna ako dun sa planking photo! hehehe! still, congrats pa rin teh, angaling!! 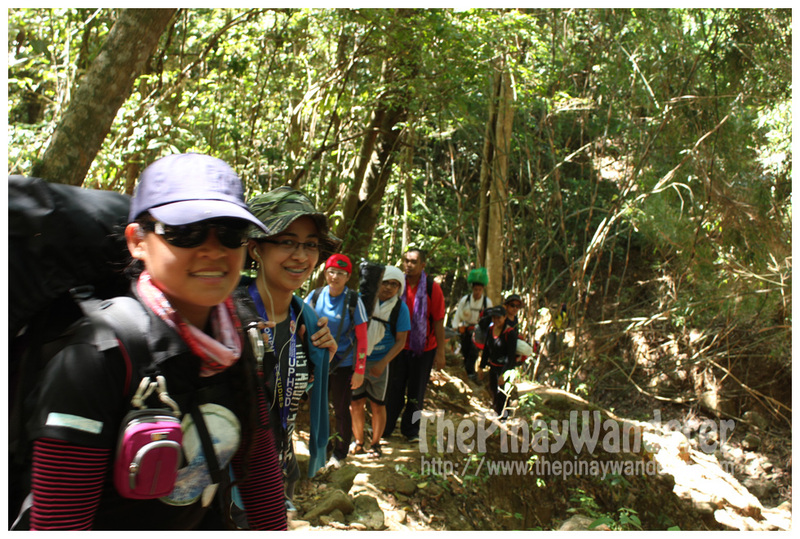 mas masaya talaga ang climb pag may kasamang mga friends! i can't remember ever camping before except in Girls Scout and I sure would like to try it again, lol! Just dropping by!Happy weekend and happy mother's day to your mom! handa ng view! hope I can enjoy the heights as you do para maexperience ko ang ganyan. may tanung lng po ako,, mga magkanu po nagastos nio per person sa pagpunta nio dun? txka hnd po ba kayo nag arkila ng sasakyan? skip-reading eh?! hehe... 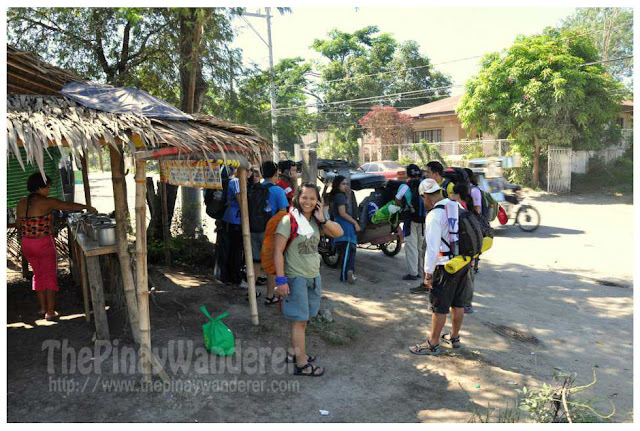 It was stated in the post, last part, 325 pesos transpo & registration fees, foods & drinks depend on your needs. From Naic, nag-arkila kami ng jeep to denr, 900 pesos if I remembered it right, bus lang from Manila. may bumabyahe po bang jeep from naic to denr para hnd na po kmi mag arkila ng jeep hehe.. sorry po sa abala. Ala daw byahe dun, arkila lang talaga, jeep or tricycle, di ko alam magkano arkila sa trike. Para sa gastos per person, add mo na lang yun mga sinabi ko na gastos. nice blog,, mga magkanu kya expense nmin per person kung pupunta kmi jan?